This cornucopia grid copy is a real challenge of your child's observation and drawing skills - there is so much detail to include! There are at least 4 Harvest themed words to be found in this Harvest boggler puzzle. Can your children find them all? Help this farmer, who is gathering fruit and veg at harvest time, find her way to the pumpkin! Here's a crossword with a difference! Children need to recognise the pictures to complete this Harvest picture crossword. 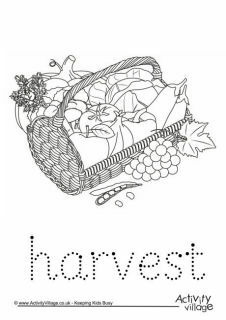 There are 12 Harvest themed words hidden in this Harvest word search. If you get stuck we have the answers to download too. Can you help the scarecrow get to the pumpkin patch in this autumn printable maze? Hve fun with these 3 challenging circular mazes - perfect for autumn, Harvest, Thanksgiving or Halloween perhaps. You could even cut out the outline of the pumpkin and laminate the mazes for repeat use with a dry wipe pen.